Although I never enjoyed math in school, I’m finding I enjoy teaching it as a homeschool mom. 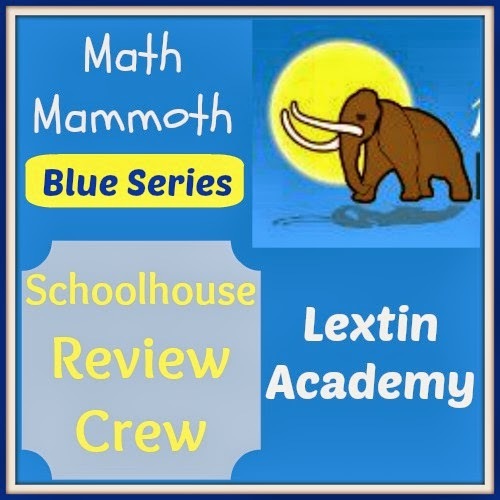 To add to our math studies, we reviewed the Math Mammoth Blue Series! Math Mammoth offers math workbooks for grades 1-12. All Math Mammoth books are written directly to the student and all teaching instruction is included right in the workbooks. The texts focus on conceptual understanding and include mental math exercises and puzzle-type problems for additional challenge. The Math Mammoth Blue Series is a set of workbooks that each focus on one topic such as geometry, fractions, or telling time. All teaching information, problems, and explanations are included in the text. Each topical workbook contains teaching information that spans several grade levels, to use as remedial work in a specific topical area, for additional practice, for review, or for supplemental teaching. The different titles in the Blue Series are appropriate for students in grades 1-7. Each workbook contains links and information about further teaching for each topic. The rest of the workbook is divided by subtopic and contains all teaching information and problems. The last few pages of each workbook contain the answer key. The workbooks can be purchased as digital downloads and vary in price from $2 – $7. They can also be purchased as printed copies or you can purchase the entire series as a download for $95 or on a CD for $100. You can see a complete list of Blue Series titles here and can sign up to view generous samples here. The Blue Series are topical books. We used ours like unit studies working as far as we could in each book before moving to the next topic. We started with geometry and Curly learned about shapes, angles, vertices, perimeter, and area. She especially loved drawing shapes in the grids to complete the shape patterns. Next we worked on measurements to understand length, volume, and weight. Curly enjoyed guessing the length or weight of items and then actually measuring to see how close she was. It should be noted that Math Mammoth is more of a mastery-based math program and therefore does not contain spiral review like that found in other math programs. There is review in the program as it is not a complete mastery program however. This aspect is not a problem or dislike for us, but the program might not work for students who like and need a very spiral program. I like that Math Mammoth is taught to the student and has simple explanations with clear examples so that a student could work through most lessons independently. There are many practice problems included in the program so that mastery is promoted and can be achieved. However, there is still enough review for Curly to retain the concepts. Curly enjoys that the pages do have some color. She is a visual learner and color is something that is helpful to her. It was a nice change to stay completely on one topic for several weeks and take the time to master the material. I found these books to be perfect for summer review or for short unit studies when we need a break from our regular curriculum. We love Math Mammoth at our house! I love the way it is clearly explained and taught to the student so that Curly can work on it independently. Curly enjoys the concise explanations and she loves the puzzle-type problems that are on some of the pages. I feel it has a great blend of teaching to mastery, with some review, and lots of conceptual problems. We will keep working through our Blue Series workbooks this summer. And as a complete disclaimer: I also use the Light Blue Series with Curly. She works through the Grade 1 materials on her own. We use a combination of 2 math programs at our house because I love them both for different reasons. Math Mammoth is one of those! What does the Crew think? See other reviews by the Crew here!